On August 13, 2014, at 10am PDT, Meeting of the Minds will host a 1-hour webinar on the innovative new business models that are shaping our cities. Creating attractive and competitive business environments is key to the success of cities, regions and nations. Whether a mature or emerging economy, locations that manage to create positive business environments stand to gain tremendously from increased economic growth, job creation and prosperity. To accomplish this, governments and agencies must become agile – striking a delicate balance among business, talent and technology – to facilitate sustainable growth. As cities, regions and countries are confronted with these significant challenges, they are also faced with new opportunities for technology-enabled improvement that constitute a paradigmatic shift in economic development. From how we manage infrastructure and utilities, to how education, health and social services are delivered to better meet the needs of citizens and business, we are witnessing a dramatic shift in how economic development can be achieved. Ushered in by a convergence of technologies that use the power of data, we are now able to improve locations in a smarter way. 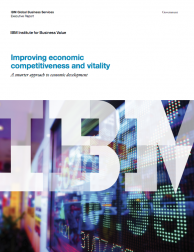 As noted in a recent speech by Ginni Rometty, “Data promises to be for the twenty-first century what steam power was for the eighteenth, electricity for the nineteenth and fossil fuels for twentieth – that is, the creator of enormous wealth and progress.” This opens up significant new opportunities for us to help transform economies through new business models. Rizwan (Riz) Khaliq is Director of Marketing and Communications for IBM Global Public Sector and Smarter Cities, where he has responsibilities for all marketing, go to market and communications for Public Sector industries which includes, Government, Healthcare, Life Sciences and Education. Riz has been with IBM for more then 13 years, prior to his current role Riz was the Director of Marketing and Communications for IBM Global Communications Sector, Business Area Leader for IBM Intelligent Transportation Systems, Business Unit Executive for IBM’s Digital Communities Business., Global Wireless Solutions and Marketing Executive for Public Sector and also held a position of Business Development Executive in Stockholm, Sweden for IBM’s Wireless/ Pervasive business in the EMEA (Europe, Middle East, and Africa) region. Before joining IBM, Riz was with the US Foreign Service and served as Commercial Attaché at the US embassies in Demark and South Africa. Riz also carried out temporary assignments in a number of international markets, including Kenya, India, Pakistan, and Germany. Riz has received numerous awards over his career, including “Gold Medal Award” for Distinguished Achievements in Foreign Services from US Secretary of Commerce, The Secretary’s Award from US Department of State Secretary and the highly regarded “Thomas Jefferson Star for Foreign Service” from the United Stated President George W. Bush. Riz holds a Masters of Arts in International Transactions and Bachelor of Arts from George Mason University. 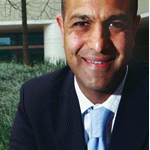 As part of the Masters program, Riz attended St. Peters College, Oxford University with the focus on international trade from the European prospective.